Judicial independence is a fundamental aspect of law and governance in Australia, commanding near universal endorsement. Despite its vital importance, the independence of the Australian judiciary is threatened on a variety of fronts. 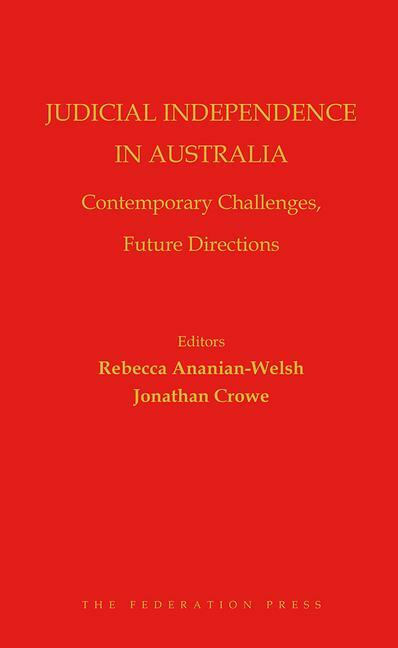 This volume brings together some of Australia’s leading constitutional scholars to discuss judicial independence and its contemporary challenges, including challenges posed by politics, judicial selection, extra-judicial activities, social media and the war on terror. Contributions include theoretical, empirical and comparative perspectives. The book includes an initial essay by former Chief Justice of the High Court of Australia, Sir Anthony Mason AC KBE CBE QC. The volume provides a valuable guide to future directions in law and governance, with an eye to strengthening judicial independence in Australia. 2. The Two Theses of the Philosophy of Separating Powers: Who Exercises Power and How? 5. Is Talk of the Quality of Judging Sometimes Strained, Feigned or not Sustained? 16. Social Media and the Judiciary: A Challenge to Judicial Independence?